Fr. Francis Joseph presents the report on behalf of Education Council of Thamileelam's Director General, Mr.V.Ilankumaran, at the Northeast education workshop held in Trincomalee Thursday. 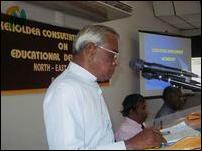 "The LTTE Education Council is of the opinion that the NEP must have its own Provincial Institute of Education (PIE) so that designing of curriculum can be done to suit the province, of course, if need be under the guidelines given by the National Institute of Education (NIE)," the report further stated. Rev.Fr Francis Joseph presented the fourteen- page report on behalf of Mr.V.Ilankumaran, Director General of Education Council of Thamileelam on the topic " Key Concerns in the Educational Sector of NEP". Any educationist will accept that a child will develop only in congenial environment he or she is used to. Uprooting children from their original places not only affects the educational development but also affects them mentally. Therefore, it is very essential to re-open the closed schools and transfer them to their original locations. A survey has to be carried out and appropriate plans have to be drawn up. Now I would like to touch upon a very sensitive issue, yet most urgent, that of the children in schools in the high security zones (HSZ), and of schools in the vicinity of these zones and those surrounded by army camps. Out of 40 schools that were in the HSZ in the north, 17 are closed, the rest (23) are functioning temporarily in other areas. There are about 20 other schools that are surrounded by army camps. The children in these schools are placed in an unimaginable situation of fear and anxiety as they move in and out of schools and during school hours. Some prominent schools, such as Hartley College and Methodist School in Point Pedro, Union College and Thanthai Chelva Primary School, to mention a few, are undergoing untold hardships and the children are having traumatic experiences due to the presence of the army and their behaviour and activities. Creation and continuation of such a situation is a gross violation of the fundamental human rights of children. The teacher vacancy in the northeast province has been there since the establishment of the provincial council system, and the provincial council is unable to recruit teachers and has to wait for instruction from the line ministry. We are unable to understand why it is so. Killinochchi, Mullaitivu, Thunukkai, Vavuniya north and Madhu are the worst affected zones. More than 35% of the approved teacher cadre is not filled. If not for the volunteer teachers employed in the area the provincial council may have closed down most of the schools in these areas. We wish to ask why there should be shortage in the NEP up to 4000 when there is an excess of 14, 000 teachers in other Sinhala provinces. Can international agencies accept this state of affairs and justify the action taken by the government? Why is that the World Bank and the NGOO close their eyes to this anomaly? Please open your eyes and bring pressure on the government and the provincial council to rectify this injustice. The central ministry of education has now called for application from the A/L qualified for post of teacher. Another curious matter about the advertisement calling for application to fill the vacancies in NEP schools is that that all applicants have to sit the competitive examination in a centre in Colombo only. Why should the Centre recruit teachers? Why cannot the Centre allow the provinces to recruit teachers? We feel that the policy of the government should be changed. They should allow the provincial council to fill the vacancies of teachers without further delay. If the vacancies are advertised district-wise and selection done subject-wise, we can get our teachers. In Vanni, the Students Organization of Liberation Tigers (SOLT), having called in for applications for schools in difficult areas, has recently appointed 28 science graduates and pays them each Rs: 7500/= per month. We never had any problem in getting adequate number of applications. But there is some mistake in the government system of recruitment since those appointed by the government to the affected areas refuse to assume duty. The government should correct the system and change the policy immediately. The National Institute of Education (NIE) is too rigid an institution. It is overdoing certain activities and not doing much. Like the Indian system all provinces must have Provincial Institute of Education (PIE). In which case, most work could be decentralized and many problems could be avoided. The LTTE Education Council is of opinion that the NEP must have its own PIE so that designing of curriculum can be done to suit the province, of course, if need be under the guidelines given by the NIE. In other words, NIE must be an advisory body and the province should do most part of the implementation. That will improve education in the province in particular and education in general of the country.